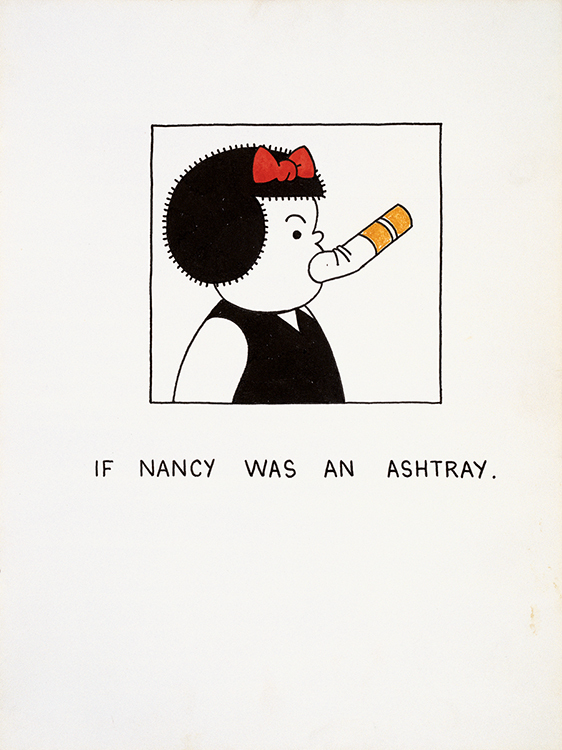 The Nancy Book revolves around Joe Brainard’s fascination with and appropriation of Nancy, the iconic newspaper cartoon character first introduced in the 1930’s. The book contains single-page works, a collection of his longer collaborations with other poets, and essays by Ann Lauterbach and Ron Padgett (some of these collaborations—with poets like Ted Berrigan, Bill Berkson, Robert Creeley, and Frank O’Hara— were notoriously difficult to track down). Together, these works are testament to create a great memory to Brainard’s shining personality and prestigious output. In I Remember, likely Brainard’s best-known work, he starts every sentence with the titular phrase to create a sort of biography traced by memories and history, both large and small. 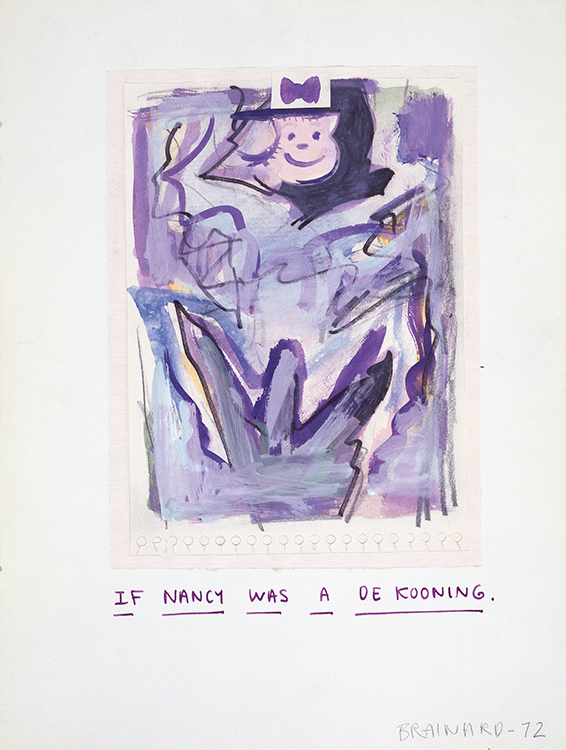 Here Nancy remains the constant, or at least some combination of her most recognizable elements (hair, eyes, mouth), while her the circumstances of her existence vary wildly. Sometimes Brainard plays by putting her in other known works of art, or sometimes in famous American landscapes. Other times he taps into an innate existential dread lurking behind her large eyes. The common denominator—and this is especially true in the more “blue” (read: overtly sexual) comics—is Nancy’s incongruity within the space or circumstance of the frame. 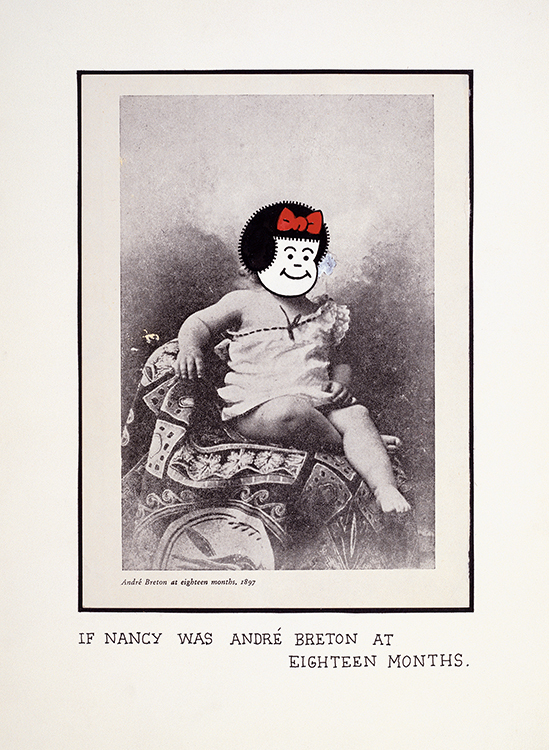 The Nancy Book is published by Siglio Press and distributed by DAP/Artbook.com. is a highly curated, monthly collection of reviews written by booksellers for booksellers about unusual and wondrous books that live at the intersection of art and literature. These are books that are deeply resistant to algorithms, easy categorization, and seven-word tag lines—inimitable books by artists and writers who obey no boundaries, pay no fealty to trends and invite readers to see the world anew by reading word and image in provocative, unfamiliar ways.